A Maiden Fillies' Stakes over 5f 10y on good to firm ground. Nine two-year-olds take part, all race bar one debutante. Oriel has been a talking horse for Richard Hannon's stable and by all accounts a frustrating juvenile for those who have backed her. A beaten favourite on three occasions and relatively short odds when contending the Queen Mary Stakes (Group 2) at Royal Ascot have proven costly. This bay filly, a daughter of Fastnet Rock, was purchase as a yearling for 60,000gns and in the ownership of Highclere Thoroughbred Racing - Petrushka. This February foal was expected to win on debut at Ascot but bumped into a true talent in Rizeena. 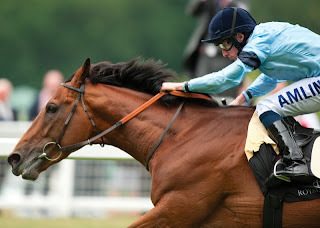 She had no luck in running behind Alutiq, then put in her place in the Queen Mary Stakes, thereafter a creditable third at Newmarket when stepping up to 6f for the first time. Connections will be expecting a win today although with a run of bad luck there will be plenty of layers who consider the misery will be prolonged. A wide draw isn't ideal but experience should see her well. Not my kind of betting at short odds but a talented juvenile who deserves a win.